This web site is dedicated to The World's Greatest Rock n Roll Band, The Rolling Stones. I've been a Stones fan since day one. 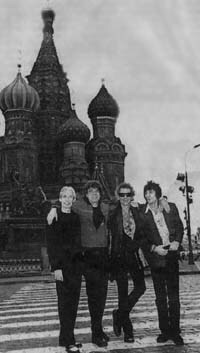 This web site started up on November 1, 1998 to communicate and have some fun with my fellow Stones fans, and to help pass on info to those non fans or future Stones fans who may want to learn a little about The Boys! So please feel free to join in here with your comments at our Gasland Message Board; by voting in our polls; or by writing up an album review. You can also check out song lyrics, cool photos of the band, and lots more! Also remember to bookmark this site so you can come back for more new stuff, as this place is always changing! Just what is Mick singing anyway? Find out in the lyrics section. Contains complete listing of all the released songs, plus many non-released bootleg songs, too. We cover a little bit of everything here in our Stones question of the week. Make sure you cast your vote now in the Stones polls, and in the other weekly rock polls we run on the domain, too! This Week's VS Stones Poll album question is: Between the Buttons vs Some Girls, which album do you like best? This Week's first Rock Poll question is: What is the best Song about Nature and Environmental problems? This Week's second Rock Poll question is: The Israelites by Desmond Dekker vs Immigrant Song by Led Zeppelin. Which song has harder to understand lyrics? This Week's Beatles Poll question is: Tie-Breaker Poll: What's your favorite one line lyric from a Beatles song? Stones Fans Top Picks Page 1 - Lists of different song favorites, plus more, as voted on by fans! Stones Fans Top Picks Page 2 - Lists of video and album favorites, plus more, as voted on by fans! Stones VS Page - List Page 3 - The Stones LPs go up against each other! Stones VS Page - List Page 4 - Stones songs, and also band members go up against each other. What's your favorite Stones album? Favorite song? Vote in our six different on going polls! Find out which albums and songs are tops amongst Stones fans. Of the artists in the Rock 'n Roll Hall of Fame, who should not be in there? Ratings from the fans and myself of the Stones albums, short reviews, song listings, lyrics and album info: personnel on each album and what instruments are the band members playing. PLUS, read reviews from other Stones fans and add your own review of the Stones albums or boots! Includes my top Top 60 list. A list of all the number one singles by the Stones in the US and UK can be found at the Stones Number 1 Singles page. Gasland is the internet's longest running Stones message board, going strong since 1998! Post messages, ask questions, or just see what's on the minds of other hard-nosed Stones fans (known here as Gassers) from all over the world. An Oral History of Stones fans, taken from Gasland's best posts! Information on the latest news about the band, including any new tours, albums or videos, etc.. Most of these are from the 60s and 70s with a few newer ones. When it comes to writing rock songs, nobody comes up with classic lines like Jagger/Richards! Here's some of their best! Mick, Keith and Brian's top ten list. Plus Bill, Charlie, Ronnie, Mick T. and Stu. Brian Jones and Keith Richards, who shined more in the '60s? What's it like to see the World's Greatest Rock Band up close? Keno's review from the first row of Stones Albuquerque show from B2B Tour. Visit other Stones sites on the web.